The European Academy of Allergy and Clinical Immunology is in the process ofdeveloping its Guideline for Food Allergy and Anaphylaxis, and this protocolof a systematic review is one of seven inter-linked evidence syntheses thatare being undertaken in order to provide a state-of-the-art synopsis of thecurrent evidence base in relation to epidemiology, prevention, diagnosis andclinical management and impact on quality of life, which will be used toinform the formulation of clinical recommendations. The aims of the systematic review will be to understand and describe theepidemiology of food allergy, i.e. frequency, risk factors and outcomes ofpatients suffering from food allergy, and to describe how thesecharacteristics vary by person, place and time. A highly sensitive search strategy has been developed to retrieve articlesthat have investigated the various aspects of the epidemiology of foodallergy. The search will be implemented by combining the concepts of foodallergy and its epidemiology from electronic bibliographic databases. This systematic review will provide the most up to date estimates of thefrequency of food allergy in Europe. We will attempt to break these down byage and geographical region in Europe. Our analysis will take into accountthe suitability of the study design and the respective study biases thatcould affect exposure and outcome. We will examine the different methods todiagnose food allergy and the associated measures of occurrence. The umbrella term ‘food hypersensitivity’ can be used to describe any‘adverse reaction to food’ . The term ‘food allergy’ refers to the sub-group offood-triggered reactions in which immunological mechanisms have been implicated,whether IgE-mediated, non-IgE-mediated, or involving a combination of IgE- andnon-IgE-mediated etiologies . All other reactions to food that were in the past sometimes referred toas ‘food intolerance’ constitute non-allergic food hypersensitivityreactions and are out of the focus of this enquiry. Allergic sensitisation to a specific food does not always lead to clinical reactions.Consequently, serological tests for food-specific IgE or the determination ofpositive skin prick test results are of themselves insufficient to establish thediagnosis of food allergy. Rather, there must also be evidence of the clinicalexpression of disease. IgE-mediated reactions can, for example, manifest asangioedema, urticaria, atopic eczema/dermatitis, oral allergy syndrome andanaphylaxis. Non-IgE-mediated immunological reactions result from activation ofother immunological pathways (e.g., T-cell mediated) and can manifest as atopiceczema/dermatitis, gastro-esophageal reflux disease, food protein-inducedenterocolitis, proctocolitis and enteropathy syndromes. The contemporary definitionof food allergy thus includes several clinical entities with differentpathophysiologies (see Table 1) resulting from exposureto different foods. Coeliac disease is an important non-IgE mediated condition butas it has distinct symptoms and prognosis different from atopic conditions it willbe excluded from this review . Uncertainty in estimating the incidence and prevalence of food allergy is in part dueto changing definitions and imprecision in terminology, with investigators oftenfailing to make clear whether they are studying food hypersensitivity in general,IgE-mediated conditions, non-IgE mediated morbidities, or some combination or subsetof these reactions. Another major contributing factor to this uncertainty is thatrelatively few epidemiological studies have utilised the gold standard of diagnosis– the double-blind, placebo-controlled food challenge (DBPCFC) [4–10]. Rather, many studies have based their estimates of the frequency of foodallergy on measurements of lay/patient perceptions of food allergy, which are knownto substantially overestimate the actual frequency [11–21]. There is clearly a need for large, population-based, longitudinalstudies employing DBPCFCs to secure the diagnosis of food allergy,  but in the interim there is also a need to make better sense of theextant literature in order to, amongst other things, inform estimates on thefrequency of the disease, provide insights into disease aetiology, and enable riskstratification, which can be used to inform management decisions and deliberationson prognosis. Epidemiological measures of particular interest for food allergy therefore includeestimates of incidence and prevalence, risk and prognostic factors, and risk ofrecurrence and death. The following epidemiological definitions proposed by Last,and adapted for food allergy will be employed in this review . Incidence rate: The number of new cases of food allergy that occurduring a given period per unit of person-time. Cumulative incidence: The number of new cases of food allergy thatoccur during a given period per the population at risk. Point prevalence: the proportion of the populationthat has experienced food allergy at a specific time. Period prevalence: the proportion of the populationthat has experienced food allergy during a given period. Lifetime : the proportion of the population that atsome point in their life will have experienced food allergy. The proportion of cases of anaphylaxis that proves fatal (usually defined withina time period). This is also sometimes known as the case fatality ratio. The European Academy of Allergy and Clinical Immunology (EAACI) is in the processof developing the EAACI Guideline for Food Allergy and Anaphylaxis, and thissystematic review is one of seven inter-linked evidence syntheses that are beingundertaken in order to provide a state-of-the-art synopsis of the currentevidence base in relation to epidemiology, prevention, diagnosis and clinicalmanagement and impact on quality of life, which will be used to inform theformulation of clinical recommendations. Describe how these characteristics vary by person, place andtime. A highly sensitive search strategy has been developed to retrieve articles thathave investigated the various aspects of the epidemiology of food allergy. Thesearch will be implemented by combining the concepts of food allergy and itsepidemiology from electronic bibliographic databases. We have conceptualised thesearch to incorporate the three elements below as shown in Figure 1: Conceptualisation of systematic review on theepidemiology of food allergy. 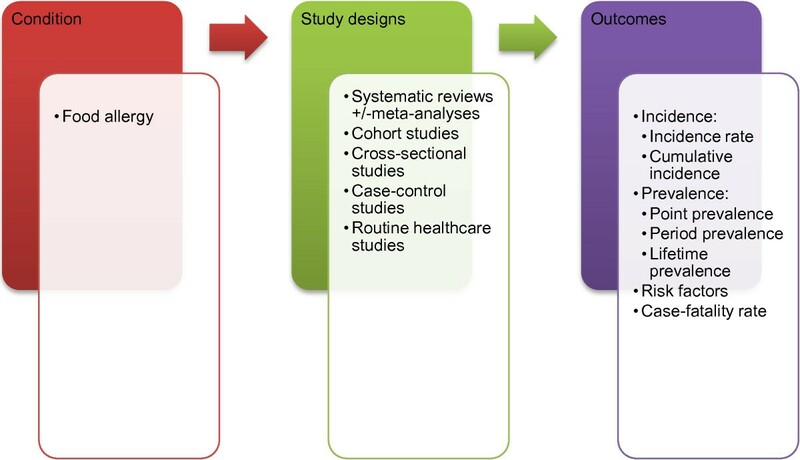 Conceptualisation of systematic review on the epidemiology of foodallergy. To retrieve systematic reviews, we will use the systematic review filterdeveloped at McMaster University Health Information Research Unit . We have also adapted the search filter from York University Centrefor Reviews and Dissemination  to retrieve incidence, prevalence and other characteristicsdescribing the epidemiology of food allergy. Similarly, we also applied theMcMaster filter for prognosis studies . The search strategy has been devised on OVID MEDLINE and then adapted for theother databases (see Additional file 1 for full searchstrategies). In all cases the databases will be searched from 1 January 2000 to30 September 2012, and limited to Europe based on the definition provided by theOrganization for Economic Co-operation and Development (OECD) . The countries covered by this restriction include Austria, Belgium,Czech Republic, Denmark, Estonia, Finland, France, Germany, Greece, Hungary,Iceland, Ireland, Italy, Luxembourg, the Netherlands, Norway, Poland, Portugal,Slovak Republic, Slovenia, Spain, Sweden, Switzerland, Turkey and the UnitedKingdom. All references will be imported into an EndNote Library and tagged withthe name of the database. Searches will be limited to literature from 2000onwards as we want to study the contemporary epidemiology of food allergy. Additional references will be located through searching the references cited bythe identified studies, and unpublished work and research in progress will beidentified through discussion with experts in the field. We will invite expertswho are active in the field from a range of disciplines and geography to commenton our search strategy, and the list of included studies. There are no languagerestrictions and, where possible, all literature will be translated. We willreport any literature which we are unable to translate. These study designs were chosen to ensure that the highest levels of evidencewere pooled based on the aims of this review . Recognising that varied methods of assessments have been used to define foodallergy across different studies, in estimating the frequency of the disease, wewill include all possible methods that have been used by the primary studies tobe included in the review, which include studies with self-reported assessment,clinician diagnosis, allergic sensitisation (based on skin prick test, specificIgE measurement, skin atopy patch test, and other radioallergosorbent test(RAST) measurements), and food challenges (open food challenge, one blinded foodchallenge, and double-blind place-controlled food challenge). For the synthesisof the studies on the risk and prognostic factors for food allergy, we willinclude only the studies that have studied objectively-verified (foodchallenges) food allergy as an outcome, as this will constitute the strongestevidence in terms of highlighting potential causal link between the risk factorsand food allergy. The titles of the retrieved articles will be checked independently by tworeviewers according to the above selection criteria and categorised as:included, not included and unsure. For those papers in the unsure category, wewill retrieve the abstract and re-categorise as above after further discussionon them. Any discrepancies will be resolved by consensus and if necessary athird reviewer will be consulted to arbitrate. Full text copies of potentiallyrelevant studies will be obtained and their eligibility for inclusionindependently assessed by two reviewers. Studies that do not fulfil all of theinclusion criteria will be excluded. Risk of bias assessments will independently be carried out on each study by tworeviewers using an adapted and modified relevant version of the CriticalAppraisal Skills Programme (CASP) quality assessment tool for systematic reviews , cohort studies and cross-sectional  and case–control studies , which involves an assessment of both internal and external validity . An overall grading and grading for the various components of eachstudy (e.g. the appropriateness of the study design for the research question,the risk of selection bias, exposure measurement, and outcome assessment) willbe given to each study. Any discrepancies will be resolved by discussion or, ifagreement could not be reached, by arbitration by a third reviewer. Data will be independently extracted onto a customised data extraction sheet bytwo reviewers, and any discrepancies will be resolved by discussion or, ifagreement could not be reached, by arbitration by a third reviewer. Adescriptive summary with data tables will be produced to summarise theliterature. If clinically and statistically appropriate, meta-analysis usingeither fixed-effect or random-effects modelling will be undertaken using methodssuggested by Agresti and Coul . A narrative synthesis of the data will also be undertaken. This review has been registered with the International Prospective Register ofSystematic Reviews (PROSPERO) and has the registration number CRD42013003704allocated to it. The Preferred Reporting Items for Systematic Reviews andMeta-Analyses (PRISMA) checklist will be used to guide the reporting of thesystematic review . This systematic synthesis of studies published between January 2000 and September2012 will provide estimates of the frequency of food allergy across different agegroups and geographical regions in Europe. It will take into account the suitabilityof the study design for the research question, potential for selection bias, and themethods of exposure and outcome assessments. One strength of the review is that wewill be able to examine all the different methods that have been used to measurefood allergy (self-report, specific sensitization to food allergens, and foodchallenges, and their various combinations) as well as the different measures ofoccurrence of food allergy (point prevalence, life-time prevalence, and incidence),which will give us the opportunity to study different estimates of the frequency offood allergy according to these varied definitions. All authors declare that they have no competing interests, financial orotherwise. BIN, SSP, LH, TR conceptualised and designed the protocol and drafted earlierversions of the document in their capacity as methodologists. TW, AM, KH-S and GRcontributed to further refinements of the protocol and revised it critically forimportant intellectual content in their capacity as guideline leads. AS led on thedevelopment of concepts used in this protocol and revised it critically forimportant intellectual content in his capacity as the methodology lead. All authorsapproved the final version to be published.